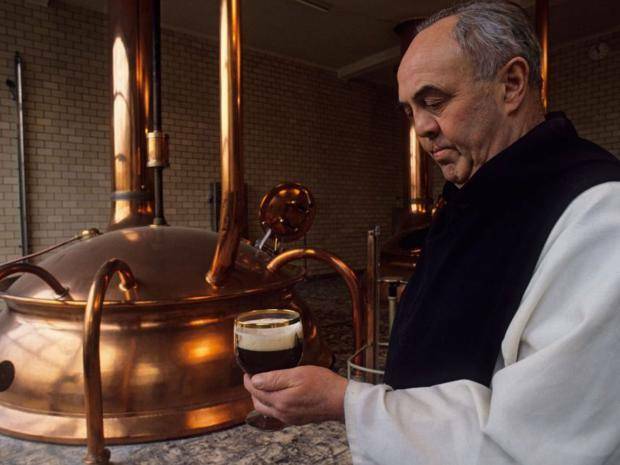 The monks at Grimbergen Abbey just north of Brussels apparently want to start brewing again, in part because visitors to the site are always asking them if they can take a look round the brewery. There are two types of monastic beer in Belgium, those with the Authentic Trappist Product logo which have to be brewed within the walls of a monastery, albeit often by secular workers under the supervision of monks, and Abbey beers which are normally contract-brewed by outside companies on their behalf. Trappist beers have a deservedly high reputation internationally, but some of the Abbey beers are up there with them in quality, notably the Sint Bernardus ones brewed in Watou. One of the Trappist breweries, Chimay, went through a spell of producing poor-quality beer with cheap ingredients a decade or so ago, although they have supposedly improved since I tried them then. I've also tried a couple of Grimbergen beers and found them, well, grim. Grimbergen was first contract-brewed by the Maes Brewery in 1958 (when I went to Belgium in 2015, Maes Pils seemed to be the beer old blokes drank in cafes first thing in the morning, the equivalent of John Smith's Smooth in Wetherspoons here) before it was taken over Scottish & Newcastle in 2000, who were then taken over themselves by Heineken and Carlsberg in 2007. The only snag the monks at Grimbergen have hit is that they can't find the mediaeval recipe for their beer and a team of researchers is now going through the documents in their library in an attempt to find it for them. I'm not sure it's that big a deal: they know from invoices what types of hops and malt were used in it, if not the exact proportions or how it was brewed, and they can just say, as other breweries have, that it's "inspired by" rather than a replica of the original. Whatever they come up with must be better than what's produced in their name now, and it's not as though anyone who drank the original beer is still alive to dispute its authenticity.